I love reading, so I was excited when this week’s I Heart Faces challenge entry had to have a book somewhere in the picture. At first, I wanted a picture with a classic book, but, with the progressing popularity of e-readers, I thought about how the “book” as we have understood it is changing quite rapidly. Now, instead of hauling around heavy boxes of books with torn pages and folded corners, we have the convenience and luxury of the electronic book and the option of downloading our newest read at the touch of a button. I will admit, I will always be a fan of the traditional book; however, the fact of the matter is that the e-reader is changing the world of reading as we know it so we might as well embrace all that it has to offer. 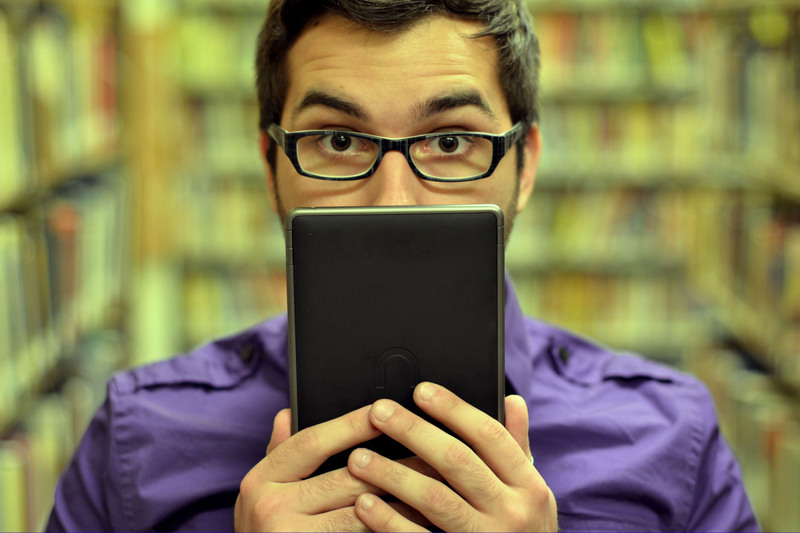 I love this picture of Bobby with his e-reader (the Nook Color), which was taken in the basement of a library. I may be nerdy for admitting this, but I just love the irony of traditional books surrounding him and the way his facial expressions came out. Couldn’t be happier with my choice for this week’s challenge! Great idea Jen! I really like your explanation behind it! Thanks for checking it out and for the comment! Absolutely Love the pic and the explanation of it. Great job! Thanks, mom! (And thanks for providing the nook too – this picture couldn’t have been done without you!). Ah I love the irony of it! Really great concept! Thanks for checking it out and commenting! I appreciate it. Nice shot. The muted greens in the background really make him and his purple shirt pop! Thanks, Mike! It was his idea to wear the purple shirt – so glad he has style! haha! Worked out to my advantage! Thanks for checking it out! NICE! Great take on the idea and great shot. Thank you, Jessica! I appreciate your comment! Thanks for checking out the site! love it, you guys are all so talented. Thank you, Nana! That means a lot! I think it runs in the family! I really like how you can see the brown in my eyes and the plaid in my glasses! Great shot, Jen! It’s always fun taking photo’s with you and such! This one turned out great! This one did turn out great! Thanks for your input on the eyes and the plaid in the glasses – I know what it’s like to have super dark eyes so I tried to get the editing just right so that the color of the brown would be lighter than the black of the pupils! So glad you took notice! I always have fun too! Thanks for being awesome! Thanks! Thanks! Thanks! You’re awesome too!